There is little doubt that the EOTech Holosight is one of the best red dot sights available today. However, our customers have told us that they think it is missing an important element-LENS COVERS. We think they are right, so we developed a set that is easy to install and operate. 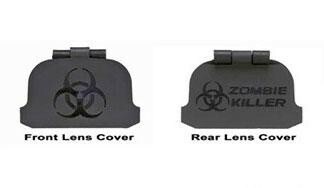 The GG&G EOTech Lens Covers fit between the EOTech hood and the body of the EOTech housing. They are spring operated so that once pressure is applied to release them from the closed position, they spring open. The rear cover lays across the top, so as not to interfere with the field of view. The front cover opens and serves as a sun shield. However, if heavy brush etc. is encountered, the front lens will fold back so that it is not damaged. Because of the contours of the EOTech housing, these rifle scope lens covers are not 100% waterproof, but they do prevent most dust, debris, rain and snow from accumulating on the lenses. These unique lens covers for scopes can be easily operated with either hand to provide flexibility of operation. The design and methodology is so unique that we were awarded a patent.